Describe important ways in which our affective states can influence our social cognition, both directly and indirectly, for example, through the operation of the affect heuristic. Outline mechanisms through which our social cognition can alter our affective states, for instance, through the mechanism of misattribution of arousal. Review the role that strategies, including cognitive reappraisal, can play in successful self-regulation. Explore the relationship between positive cognition, affect, and behaviors. Outline important findings in relation to our affective forecasting abilities. This chapter is about social cognition, and so it should not be surprising that we have been focusing, so far, on cognitive phenomena, including schemas and heuristics, that affect our social judgments. In reality, though, these cognitive influences do not operate in isolation from our feelings, or affect. Indeed, researchers have long been interested in the complex ways in which our thoughts are shaped by our feelings, and vice versa (Oatley, Parrott, Smith, & Watts, 2011). There is abundant evidence that our social cognition is strongly influenced by our affective states. For example, whatever current mood we are experiencing can influence our judgments of people we meet. Think back to a time when you were in a positive mood when you were introduced to someone new versus a time you were in a negative mood. The chances are that you made more positive evaluations than you did when you met a person when you were feeling bad (Clore, Schwarz, & Conway, 1993). Don’t new places also often seem better when you visit them in a good mood? The influences of mood on our social cognition even seem to extend to our judgments about ideas, with positive mood linked to more positive appraisals than neutral mood (Garcia-Marques, Mackie, Claypool & Garcia-Marques, 2004). Positive moods may even help to reduce negative feelings toward others. For example, Ito, Chiao, Devine, Lorig, and Cacioppo (2006) found that people who were smiling were also less prejudiced. Mood states are also powerful determinants of our current judgments about our well-being. Norbert Schwarz and Gerald Clore (1983) called participants on the telephone, pretending that they were researchers from a different city conducting a survey. Furthermore, they varied the day on which they made the calls, such that some of the participants were interviewed on sunny days and some were interviewed on rainy days. During the course of the interview, the participants were asked to report on their current mood states and also on their general well-being. Schwarz and Clore found that the participants reported better moods and greater well-being on sunny days than they did on rainy days. Schwarz and Clore wondered whether people were using their current mood (“I feel good today”) to determine how they felt about their life overall. To test this idea, they simply asked half of their respondents about the local weather conditions at the beginning of the interview. The idea was to subtly focus these participants on the fact that the weather might be influencing their mood states. They found that as soon as they did this, although mood states were still influenced by the weather, the weather no longer influenced perceptions of well-being (Figure 2.3.1, “Mood as Information”). 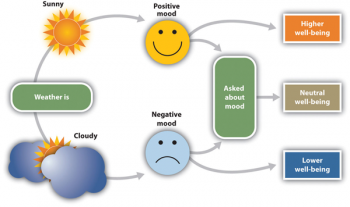 When the participants were aware that their moods might have been influenced by the weather, they realized that the moods were not informative about their overall well-being, and so they no longer used this information. Similar effects have been found for mood that is induced by music or other sources (Keltner, Locke, & Audrain, 1993; Savitsky, Medvec, Charlton, & Gilovich, 1998). Figure 2.3.1 Mood as Information. The current weather influences people’s judgments of their well-being, but only when they are not aware that it might be doing so. After Schwarz and Clore (1983). Even moods that are created very subtly can have effects on our social judgments. 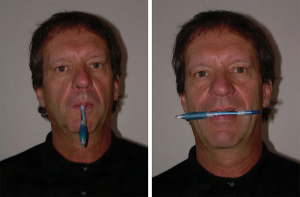 Fritz Strack and his colleagues (Strack, Martin, & Stepper, 1988) had participants rate how funny cartoons were while holding a writing pen in their mouth such that it forced them either to use muscles that are associated with smiling or to use muscles that are associated with frowning (Figure 2.3.2, “Facial Expression and Mood”). They found that participants rated the cartoons as funnier when the pen created muscle contractions that are normally used for smiling rather than frowning. And Stepper and Strack (1993) found that people interpreted events more positively when they were sitting in an upright position rather than a slumped position. Even finding a coin in a pay phone or being offered some milk and cookies is enough to put people in a good mood and to make them rate their surroundings more positively (Clark & Isen, 1982; Isen & Levin, 1972; Isen, Shalker, Clark, & Karp, 1978). Figure 2.3.2 Facial Expression and Mood. The position of our mouth muscles can influence our mood states and our social judgments (Strack, Martin, & Stepper, 1988). Given the power of the affect heuristic to influence our judgments, it is useful to explore why it is so strong. As with other heuristics, Kahneman and Frederick (2002) proposed that the affect heuristic works by a process called attribute substitution, which happens without conscious awareness. According to this theory, when somebody makes a judgment about a target attribute that is very complex to calculate, for example, the overall suitability of a candidate for a job, that person tends to substitute these calculations for an easier heuristic attribute, for example, the likeability of a candidate. In effect, we deal with cognitively difficult social judgments by replacing them with easier ones, without being aware of this happening. To return to our choice of job applicant, rather than trying to reach a judgment based on the complex question of which candidate would be the best one to select, given their past experiences, future potential, the demands of the position, the organizational culture, and so on, we choose to base it on the much simpler question of which candidate do we like the most. In this way, people often do hire the candidates they like the best, and, not coincidentally, also those who tend to be more similar to themselves (Rivera, 2012). So far, we have seen some of the many ways that our affective states can directly influence our social judgments. There are other, more indirect means by which this can happen, too. As well as affecting the content of our social judgments, our moods can also affect the types of cognitive strategies that we use to make them. Our current mood, either positive or negative, can, for instance, influence our tendency to use more automatic versus controlled thinking about our social worlds. For example, there is some evidence that being in a happy, as opposed to a neutral, mood can actually make people more likely to rely on cognitive heuristics than on more effortful strategies (Ruder & Bless, 2003). There are also indications that experiencing certain negative affective states, for example anger, can cause individuals to make more stereotypical judgments of others, compared with individuals who are in a neutral mood (Bodenhausen, Sheppard, & Kramer, 1994). So, being in particular affective states may further increase the likelihood of us relying on heuristics, and these processes, as we have already seen, have big effects on our social judgments. Affect may also influence our social judgments indirectly by influencing the type of information that we draw on. Our mood can, for example, affect both the type and intensity of our schemas that are active in particular situations. For instance, when in an angry mood, we may find that our schemas relating to that emotion are more active than those relating to other affective states, and these schemas will in turn influence our social judgments (Lomax & Lam, 2011). In addition to influencing our schemas, our mood can also cause us to retrieve particular types of memories that we then use to guide our social judgments. Mood-dependent memory describes a tendency to better remember information when our current mood matches the mood we were in when we encoded that information. For example, if we originally learned the information while experiencing positive affect, we will tend to find it easier to retrieve and then use if we are currently also in a good mood. Similarly, mood congruence effects occur when we are more able to retrieve memories that match our current mood. Have you ever noticed, for example, that when you are feeling sad, that sad memories seem to come more readily to mind than happy ones? So, our affective states can influence our social cognition in multiple ways, but what about situations where our cognition influences our mood? Here, too, we find some interesting relationships. Just as they have helped to illuminate some of the routes through which our moods influence our cognition, so social cognitive researchers have also contributed to our knowledge of how our thoughts can change our moods. Indeed, some researchers have argued that affective experiences are only possible following cognitive appraisals. Although physiological arousal is necessary for emotion, many have argued that it is not sufficient (Lazarus, 1984). Under this view, arousal becomes emotion only when it is accompanied by a label or by an explanation for the arousal (Schachter & Singer, 1962). If this is correct, then emotions have two factors—an arousal factor and a cognitive factor (James, 1890; Schachter & Singer, 1962). In some cases, it may be difficult for people who are experiencing a high level of arousal to accurately determine which emotion they are experiencing. That is, they may be certain that they are feeling arousal, but the meaning of the arousal (the cognitive factor) may be less clear. Some romantic relationships, for instance, are characterized by high levels of arousal, and the partners alternately experience extreme highs and lows in the relationship. One day they are madly in love with each other, and the next they are having a huge fight. In situations that are accompanied by high arousal, people may be unsure what emotion they are experiencing. In the high-arousal relationship, for instance, the partners may be uncertain whether the emotion they are feeling is love, hate, or both at the same time. Misattribution of arousal occurs when people incorrectly label the source of the arousal that they are experiencing. If you think a bit about your own experiences of different emotions, and if you consider the equation that suggests that emotions are represented by both arousal and cognition, you might start to wonder how much was determined by each. That is, do we know what emotion we are experiencing by monitoring our feelings (arousal) or by monitoring our thoughts (cognition)? Stanley Schachter and Jerome Singer (1962) addressed this question in a well-known social psychological experiment. Schachter and Singer believed that the cognitive part of the emotion was critical—in fact, they believed that the arousal that we are experiencing could be interpreted as any emotion, provided we had the right label for it. Thus they hypothesized that if individuals are experiencing arousal for which they have no immediate explanation, they will “label” this state in terms of the cognitions that are most accessible in the environment. On the other hand, they argued that people who already have a clear label for their arousal would have no need to search for a relevant label and therefore should not experience an emotion. In the research experiment, the male participants were told that they would be participating in a study on the effects of a new drug, called “suproxin,” on vision. On the basis of this cover story, the men were injected with a shot of epinephrine, a drug that produces physiological arousal. The idea was to give all the participants arousal; epinephrine normally creates feelings of tremors, flushing, and accelerated breathing in people. Then, according to random assignment to conditions, the men were told that the drug would make them feel certain ways. The men in the epinephrine-informed condition were told the truth about the effects of the drug—they were told that other participants had experienced tremors and that their hands would start to shake, their hearts would start to pound, and their faces might get warm and flushed. The participants in the epinephrine-uninformed condition, however, were told something untrue—that their feet would feel numb, that they would have an itching sensation over parts of their body, and that they might get a slight headache. The idea was to make some of the men think that the arousal they were experiencing was caused by the drug (the informed condition), whereas others would be unsure where the arousal came from (the uninformed condition). Then the men were left alone with a confederate who they thought had received the same injection. While they were waiting for the experiment (which was supposedly about vision) to begin, the confederate behaved in a wild and crazy (Schachter and Singer called it “euphoric”) manner. He wadded up spitballs, flew paper airplanes, and played with a hula hoop. He kept trying to get the participants to join in his games. Then right before the vision experiment was to begin, the participants were asked to indicate their current emotional states on a number of scales. One of the emotions they were asked about was euphoria. If you are following the story here, you will realize what was expected—that the men who had a label for their arousal (the informed group) would not be experiencing much emotion—they had a label already available for their arousal. The men in the misinformed group, on the other hand, were expected to be unsure about the source of the arousal—they needed to find an explanation for their arousal, and the confederate provided one. Indeed, as you can see in Figure 2.3.3, “Misattributing Emotion,” this is just what the researchers found. Then Schachter and Singer did another part of the study, using new participants. Everything was exactly the same except for the behavior of the confederate. Rather than being euphoric, he acted angry. He complained about having to complete the questionnaire he had been asked to do, indicating that the questions were stupid and too personal. He ended up tearing up the questionnaire that he was working on, yelling, “I don’t have to tell them that!” Then he grabbed his books and stormed out of the room. What do you think happened in this condition? The answer, of course, is, exactly the same thing—the misinformed participants experienced more anger than did the informed participants. The idea is that because cognitions are such strong determinants of emotional states, the same state of physiological arousal could be labeled in many different ways, depending entirely on the label provided by the social situation. We will revisit the effects of misattribution of arousal when we consider sources of romantic attraction. Figure 2.3.3 Misattributing Emotion. The results of an experiment by Schachter and Singer (1962) supported the two-factor theory of emotion. The participants who did not have a clear label for their arousal were more likely to take on the emotion of the confederate. So, our attribution of the sources of our arousal will often strongly influence the emotional states we experience in social situations. How else might our cognition influence our affect? Another example is demonstrated in framing effects, which occur when people’s judgments about different options are affected by whether they are framed as resulting in gains or losses. In general, people feel more positive about options that are framed positively, as opposed to negatively. For example, individuals seeking to eat healthily tend to feel more positive about a product described as 95% fat free than one described as 5% fat, even though the information in the two messages is the same. In the same way, people tend to prefer treatment options that stress survival rates as opposed to death rates. Framing effects have been demonstrated in regards to numerous social issues, including judgments relating to charitable donations (Chang & Lee, 2010) and green environmental practices (Tu, Kao, & Tu, 2013). In reference to our chapter case study, they have also been implicated in decisions about risk in financial contexts and in the explanation of market behaviors (Kirchler, Maciejovsky, & Weber, 2010). Social psychologists have also studied how we use our cognitive faculties to try to control our emotions in social situations, to prevent them from letting our behavior get out of control. The process of setting goals and using our cognitive and affective capacities to reach those goals is known as self-regulation, and a good part of self-regulation involves regulating our emotions. To be the best people that we possibly can, we have to work hard at it. Succeeding at school, at work, and at our relationships with others takes a lot of effort. When we are successful at self-regulation, we are able to move toward or meet the goals that we set for ourselves. When we fail at self-regulation, we are not able to meet those goals. People who are better able to regulate their behaviors and emotions are more successful in their personal and social encounters (Eisenberg & Fabes, 1992), and thus self-regulation is a skill we should seek to master. A significant part of our skill in self-regulation comes from the deployment of cognitive strategies to try to harness positive emotions and to overcome more challenging ones. For example, to achieve our goals we often have to stay motivated and to be persistent in the face of setbacks. If, for example, an employee has already gone for a promotion at work and has been unsuccessful twice before, this could lead him or her to feel very negative about his or her competence and the possibility of trying for promotion again, should an opportunity arise. In these types of challenging situations, the strategy of cognitive reappraisal can be a very effective way of coping. Cognitive reappraisal involves altering an emotional state by reinterpreting the meaning of the triggering situation or stimulus. For example, if another promotion position does comes up, the employee could reappraise it as an opportunity to be successful and focus on how the lessons learned in previous attempts could strengthen his or her candidacy this time around. In this case, the employee would likely feel more positive towards the opportunity and choose to go after it. Using strategies like cognitive reappraisal to self-regulate negative emotional states and to exert greater self-control in challenging situations has some important positive outcomes. Consider, for instance, research by Walter Mischel and his colleagues (Mischel, Shoda, & Rodriguez, 1989). In their studies, they had four- and five-year-old children sit at a table in front of a yummy snack, such as a chocolate chip cookie or a marshmallow. The children were told that they could eat the snack right away if they wanted to. However, they were also told that if they could wait for just a couple of minutes, they’d be able to have two snacks—both the one in front of them and another just like it. However, if they ate the one that was in front of them before the time was up, they would not get a second. Mischel found that some children were able to self-regulate—they were able to use their cognitive abilities to override the impulse to seek immediate gratification in order to obtain a greater reward at a later time. Other children, of course, were not—they just ate the first snack right away. Furthermore, the inability to delay gratification seemed to occur in a spontaneous and emotional manner, without much thought. The children who could not resist simply grabbed the cookie because it looked so yummy, without being able to cognitively stop themselves (Metcalfe & Mischel, 1999; Strack & Deutsch, 2007). The ability to self-regulate in childhood has important consequences later in life. When Mischel followed up on the children in his original study, he found that those who had been able to self-regulate as children grew up to have some highly positive characteristics—they got better SAT scores, were rated by their friends as more socially adept, and were found to cope with frustration and stress better than those children who could not resist the tempting first cookie at a young age. Effective self-regulation is therefore an important key to success in life (Ayduk et al., 2000; Eigsti et al., 2006; Mischel, Ayduk, & Mendoza-Denton, 2003). Self-regulation is difficult, though, particularly when we are tired, depressed, or anxious, and it is under these conditions that we more easily lose our self-control and fail to live up to our goals (Muraven & Baumeister, 2000). If you are tired and worried about an upcoming test, you may find yourself getting angry and taking it out on your friend, even though your friend really hasn’t done anything to deserve it and you don’t really want to be angry. It is no secret that we are more likely to fail at our diets when we are under a lot of stress or at night when we are tired. In these challenging situations, and when our resources are particularly drained, the ability to use cognitive strategies to successfully self-regulate becomes more even more important, and difficult. Muraven, Tice, and Baumeister (1998) conducted a study to demonstrate that emotion regulation—that is, either increasing or decreasing our emotional responses—takes work. They speculated that self-control was like a muscle—it just gets tired when it is used too much. In their experiment, they asked their participants to watch a short movie about environmental disasters involving radioactive waste and their negative effects on wildlife. The scenes included sick and dying animals, which were very upsetting. According to random assignment to conditions, one group (the increase-emotional-response condition) was told to really get into the movie and to express emotions in response to it, a second group was to hold back and decrease emotional responses (the decrease-emotional-response condition), and a third (control) group received no instructions on emotion regulation. Both before and after the movie, the experimenter asked the participants to engage in a measure of physical strength by squeezing as hard as they could on a hand-grip exerciser, a device used for building up hand muscles. The experimenter put a piece of paper in the grip and timed how long the participants could hold the grip together before the paper fell out. Table 2.3.1, “Self-Control Takes Effort,” shows the results of this study. It seems that emotion regulation does indeed take effort because the participants who had been asked to control their emotions showed significantly less ability to squeeze the hand grip after the movie than before. Thus the effort to regulate emotional responses seems to have consumed resources, leaving the participants less capacity to make use of in performing the hand-grip task. Participants who had been required to either express or refrain from expressing their emotions had less strength to squeeze a hand grip after doing so. Data are from Muraven et al. (1998). In other studies, people who had to resist the temptation to eat chocolates and cookies, who made important decisions, or who were forced to conform to others all performed more poorly on subsequent tasks that took energy in comparison to people who had not been emotionally taxed. After controlling their emotions, they gave up on subsequent tasks sooner and failed to resist new temptations (Vohs & Heatherton, 2000). Can we improve our emotion regulation? It turns out that training in self-regulation—just like physical training—can help. Students who practiced doing difficult tasks, such as exercising, avoiding swearing, or maintaining good posture, were later found to perform better in laboratory tests of self-regulation (Baumeister, Gailliot, DeWall, & Oaten, 2006; Baumeister, Schmeichel, & Vohs, 2007; Oaten & Cheng, 2006), such as maintaining a diet or completing a puzzle. You have probably heard about “the power of positive thinking”—the idea that thinking positively helps people meet their goals and keeps them healthy, happy, and able to effectively cope with the negative events that they experience. It turns out that positive thinking really works. People who think positively about their future, who believe that they can control their outcomes, and who are willing to open up and share with others are happier, healthier people (Seligman & Csikszentmihalyi, 2000). The power of positive thinking comes in different forms, but they are all helpful. Notwithstanding the potential risks of wildly optimistic beliefs about the future, outlined earlier in this chapter, some researchers have studied the effects of having an optimistic explanatory style, a way of explaining current outcomes affecting the self in a way that leads to an expectation of positive future outcomes, and have found that optimists are happier and have less stress (Carver & Scheier, 2009). Others have focused on self-efficacy, the belief in our ability to carry out actions that produce desired outcomes. People with high self-efficacy feel more confident to respond to environmental and other threats in an active, constructive way—by getting information, talking to friends, and attempting to face and reduce the difficulties they are experiencing. These people, too, are better able to ward off their stresses in comparison with people with less self-efficacy (Thompson, 2009). Self-efficacy helps in part because it leads us to perceive that we can control the potential stressors that may affect us. Workers who have control over their work environment (e.g., by being able to move furniture and control distractions) experience less stress, as do patients in nursing homes who are able to choose their everyday activities (Rodin, 1986). Glass, Reim, and Singer (1971) found in a study that participants who believed they could stop a loud noise experienced less stress than those who did not think they could, even though the people who had the option never actually used it. The ability to control our outcomes may help explain why animals and people who have higher social status live longer (Sapolsky, 2005). Importantly, it is possible to learn to think more positively, and doing so can be beneficial to our moods and behaviors. For example, Antoni et al. (2001) found that pessimistic cancer patients who were given training in optimism reported more optimistic outlooks after the training and were less fatigued after their treatments. Another way in which our cognition intersects with our emotions occurs when we engage in affective forecasting, which describes our attempts to predict how future events will make us feel. For example, we may decide to apply for a promotion at work with a larger salary partly based on forecasting that the increased income will make us happier. While it is true that we do need money to afford food and adequate shelter for ourselves and our families, after this minimum level of wealth is reached, more money does not generally buy more happiness (Easterlin, 2005). For instance, citizens in many countries today have several times the buying power they had in previous decades, and yet overall reported happiness has not typically increased (Layard, 2005). Psychologists have found that our affective forecasting is often not very accurate (Wilson & Gilbert, 2005). For one, we tend to overestimate our emotional reactions to events. Although we think that positive and negative events that we might experience will make a huge difference in our lives, and although these changes do make at least some difference in well-being, they tend to be less influential than we think they are going to be. Positive events tend to make us feel good, but their effects wear off pretty quickly, and the same is true for negative events. For instance, Brickman, Coates, and Janoff-Bulman (1978) interviewed people who had won more than $50,000 in a lottery and found that they were not happier than they had been in the past and were also not happier than a control group of similar people who had not won the lottery. On the other hand, the researchers found that individuals who were paralyzed as a result of accidents were not as unhappy as might be expected. How can this possibly be? There are several reasons. For one, people are resilient; they bring their coping skills into play when negative events occur, and this makes them feel better. Second, most people do not continually experience very positive or very negative affect over a long period of time but, rather, adapt to their current circumstances. Just as we enjoy the second chocolate bar we eat less than we enjoy the first, as we experience more and more positive outcomes in our daily lives, we habituate to them and our well-being returns to a more moderate level (Small, Zatorre, Dagher, Evans, & Jones-Gotman, 2001). Another reason we may predict our happiness incorrectly is that our social comparisons change when our own status changes as a result of new events. People who are wealthy compare themselves with other wealthy people, people who are poor tend to compare themselves with other poor people, and people who are ill tend to compare themselves with other ill people. When our comparisons change, our happiness levels are correspondingly influenced. And when people are asked to predict their future emotions, they may focus only on the positive or negative event they are asked about and forget about all the other things that won’t change. Wilson, Wheatley, Meyers, Gilbert, and Axsom (2000) found that when people were asked to focus on all the more regular things that they will still be doing in the future (e.g., working, going to church, socializing with family and friends), their predictions about how something really good or bad would influence them were less extreme. Having reviewed some of the literature on the interplay between social cognition and affect, it is clear that we must be mindful of how our thoughts and moods shape one another, and, in turn, affect our evaluations of our social worlds. Our current affective states profoundly shape our social cognition. Our cognitive processes, in turn, influence our affective states. Our ability to forecast our future emotional states is often less accurate than we think. The better we understand these links between our cognition and affect, the better we can harness both to reach our social goals. Describe a time when you feel that the affect heuristic played a big part in a social judgment or decision that you made. What impact did this heuristic have? Looking back, how sound was the judgment or decision that you made and why? Outline a situation where you experienced either mood-dependent memory or the mood-congruence effect. What effects did this then have on your affect and social cognition? Describe a situation where you feel that you may have misattributed the source of an emotional state you experienced. Who or what did you misattribute the arousal to and why? In hindsight, who or what do you think was the actual source of your arousal? With this knowledge, outline how the emotion you experienced at the time may have been different if you had made a correct source attribution. Outline a situation that you interpreted in an optimistic way and describe how you feel that this then affected your future outcomes. Describe an instance where you feel that your affective forecasting about how a future event would make you feel was particularly inaccurate. Try to identify the reasons why your predictions were so far off the mark. Antoni, M. H., Lehman, J. M., Klibourn, K. M., Boyers, A. E., Culver, J. L., Alferi, S. M., Kilbourn, K. (2001). Cognitive-behavioral stress management intervention decreases the prevalence of depression and enhances benefit finding among women under treatment for early-stage breast cancer. Health Psychology, 20(1), 20–32. Argyle, M. (1999). Causes and correlates of happiness. In D. Kahneman, E. Diener, & N. Schwarz (Eds. ), Well being: The foundations of hedonic psychology. New York, NY: Russell Sage Foundation. Baumeister, R. F., Gailliot, M., DeWall, C. N., & Oaten, M. (2006). Self-regulation and personality: How interventions increase regulatory success, and how depletion moderates the effects of traits on behavior. Journal of Personality, 74,1773–1801. Baumeister, R. F., Schmeichel, B., & Vohs, K. D. (2007). Self-regulation and the executive function: The self as controlling agent. In A. W. Kruglanski & E. T. Higgins (Eds. ), Social psychology: Handbook of basic principles (Vol. 2). New York, NY: Guilford. Bodenhausen, G. V., Sheppard, L., & Kramer, G. P. (1994). Negative affect and social perception: The differential impact of anger and sadness. European Journal of Social Psychology, 24, 45-62. Bonanno, G. A., Wortman, C. B., Lehman, D., Tweed, R., Sonnega, J., Carr, D., et al. (2002). Resilience to loss, chronic grief, and their pre-bereavement predictors. Journal of Personality and Social Psychology, 83, 1150–1164. Brickman, P., Coates, D., & Janoff-Bulman, R. (1978). Lottery winners and accident victims: Is happiness relative? Journal of Personality and Social Psychology, 36(8), 917–927. Carver, C. S., & Scheier, M. F. (2009). Optimism. In M. R. Leary & R. H. Hoyle (Eds. ), Handbook of individual differences in social behavior (pp. 330–342). New York, NY: Guilford Press. Clark, M. S., & Isen, A. M. (1982). Toward understanding the relationship between feeling states and social behavior. In A. H. Hastorf & A. M. Isen (Eds. ), Cognitive social psychology (pp. 73–108). New York. NY: Elsevier/North-Holland. Clore, G. L., Schwarz, N., & Conway, M. (1993). Affective causes and consequences of social information processing. In R. S. Wyer & T. K. Srull (eds. ), Handbook of social cognition (2nd ed.). Hillsdale, NJ: Erlbaum. Csikszentmihalyi, M. (1999). If we are so rich, why aren’t we happy? American Psychologist, 54(10), 821–827. Eigsti, I.-M., Zayas, V., Mischel, W., Shoda, Y., Ayduk, O., Dadlani, M. B., et al. (2006). Predicting cognitive control from preschool to late adolescence and young adulthood. Psychological Science, 17(6), 478–484. Eisenberg, N., & Fabes, R. A. (1992). Emotion, regulation, and the development of social competence. In Emotion and social behavior (pp. 119–150). Thousand Oaks, CA: Sage Publications. Garcia-Marques, T., Mackie, D. M., Claypool, H. M., & Garcia-Marques, L. (2004). Positivity can cue familiarity. Personality and Social Psychology Bulletin, 30, 585-593. Glass, D. C., Reim, B., & Singer, J. E. (1971). Behavioral consequences of adaptation to controllable and uncontrollable noise. Journal of Experimental Social Psychology, 7(2), 244–257. Gross, J. J., & Levenson, R. W. (1997). Hiding feelings: The acute effects of inhibiting negative and positive emotion. Journal of Abnormal Psychology, 106(1), 95–103. Isen, A. M., Shalker, T. E., Clark, M., & Karp, L. (1978). Affect, accessibility of material in memory and behavior: A cognitive loop? Journal of Personality and Social Psychology, 36, 1–12. Ito, T., Chiao, K., Devine, P. G., Lorig, T., & Cacioppo, J. (2006). The influence of facial feedback on race bias. Psychological Science, 17, 256–61. James, W. (1890). The principles of psychology. New York, NY: Dover. Kahneman D. (2011). Thinking, fast and slow. New York: Farrar, Straus, and Giroux. Kahneman, D., & Frederick, S. (2002). Representativeness revisited: Attribute substitution in intuitive judgment. In T. Gilovich, D. Griffin & D. Kahneman (Eds. ), Heuristics and biases: The psychology of intuitive judgment (pp. 49-81). New York: Cambridge University Press. Keltner, D., Locke, K. D., & Audrain, P. C. (1993). The influence of attributions on the relevance of negative feelings to personal satisfaction. Personality and Social Psychology Bulletin, 19(1), 21–29. Kirchler, E., Maciejovsky, B., & Weber, M. (2010). Framing effects, selective information and market behavior: An experimental analysis. In B. Bruce (Ed.) , Handbook of behavioral finance (pp. 7-24). Northampton, MA US: Edward Elgar Publishing. Layard, R. (2005). Happiness: Lessons from a new science. London: Allen Lane. Lucas, R. (2007). Long-term disability is associated with lasting changes in subjective well-being: Evidence from two nationally representative longitudinal studies. Journal of Personality and Social Psychology, 92(4), 717–730. Mischel, W., Ayduk, O., & Mendoza-Denton, R. (Eds.). (2003). Sustaining delay of gratification over time: A hot-cool systems perspective. New York, NY: Russell Sage Foundation. Muraven, M., & Baumeister, R. F. (2000). Self-regulation and depletion of limited resources: Does self-control resemble a muscle? Psychological Bulletin, 126, 247–259. Muraven, M., Tice, D. M., & Baumeister, R. F. (1998). Self-control as a limited resource: Regulatory depletion patterns. Journal of Personality and Social Psychology, 74(3), 774–789. Oaten, M., & Cheng, K. (2006). Longitudinal gains in self-regulation from regular physical exercise. British Journal of Health Psychology, 11, 717–733. Oatley, K., Parrott, W. G., Smith, C., & Watts, F. (2011). Cognition and emotion over twenty-five years. Cognition and Emotion, 25(8), 1341-1348. Rodin, J. (1986). Aging and health: Effects of the sense of control. Science, 233(4770), 1271–1276. Ruder, M., & Bless, H. (2003). Mood and the reliance on the ease of retrieval heuristic. Journal of Personality and Social Psychology, 85, 20-32. Russell, J. A. (1980) A circumplex model of affect. Journal of Personality and Social Psychology, 39, 1161–1178. Sapolsky, R. M. (2005). The influence of social hierarchy on primate health. Science, 308(5722), 648–652. Savitsky, K., Medvec, V. H., Charlton, A. E., & Gilovich, T. (1998). “What, me worry?” Arousal, misattribution and the effect of temporal distance on confidence. Personality and Social Psychology Bulletin, 24(5), 529–536. Seligman, M. E. P., & Csikszentmihalyi, M. (2000). Positive psychology: An introduction. American Psychologist, 55(1), 5–14. Schachter, S., & Singer, J. (1962). Cognitive, social, and physiological determinants of emotional state. Psychological Review, 69(5), 379–399. Schwarz, N., & Clore, G. L. (1983). Mood, misattribution, and judgments of well-being: Informative and directive functions of affective states. Journal of Personality and Social Psychology, 45, 513–523. Slovic P, Finucane M, Peters E, MacGregor DG (2002) The affect heuristic. In: Gilovich T, Griffin DW, Kahneman D, editors. Heuristics and biases: The psychology of intuitive judgment. Cambridge, England: Cambridge University Press. pp. 397–420. Small, D. M., Zatorre, R. J., Dagher, A., Evans, A. C., & Jones-Gotman, M. (2001). Changes in brain activity related to eating chocolate. Brain, 124(9), 1720. Strack, F., & Deutsch, R. (2007). The role of impulse in social behavior. In A. W. Kruglanski & E. T. Higgins (Eds. ), Social psychology: Handbook of basic principles (Vol. 2). New York, NY: Guilford. Strack, F., Martin, L. L., & Stepper, S. (1988). Inhibiting and facilitating conditions of the human smile: A nonobtrusive test of the facial feedback hypothesis. Journal of Personality and Social Psychology, 54, 768–777. Stepper, S., & Strack, F. (1993). Proprioceptive determinants of emotional and nonemotional feelings. Journal of Personality and Social Psychology, 64(2), 211–220. Thompson, S. C. (2009). The role of personal control in adaptive functioning. In S. J. Lopez & C. R. Snyder (Eds. ), Oxford handbook of positive psychology (2nd ed., pp. 271–278). New York, NY: Oxford University Press. Tu, J., Kao, T., & Tu, Y. (2013). Influences of framing effect and green message on advertising effect. Social Behavior And Personality, 41(7), 1083-1098. Vohs, K. D., & Heatherton, T. F. (2000). Self-regulatory failure: A resource depletion approach. Psychological Science, 11, 249–254. Wilson, T. D., & Gilbert, D. T. (2005). Affective forecasting: Knowing what to want. Current Directions in Psychological Science, 14(3), 131–134. Wilson, T. D., Wheatley, T., Meyers, J. M., Gilbert, D. T., & Axsom, D. (2000). Focalism: A source of durability bias in affective forecasting. Journal of Personality and Social Psychology, 78(5), 821–836.